After retiring the “Most Interesting Man in the World” in March 2016, Dos Equis is pitting its Facebook fan community against one another in pursuit of being named the most interesting person in the world. The campaign is hosted on a dedicated microsite on DosEquis.com. Facebook enters the picture via a profile sync, from which the company has developed a proprietary algorithm that measures a few key attributes that rank how interesting you are. 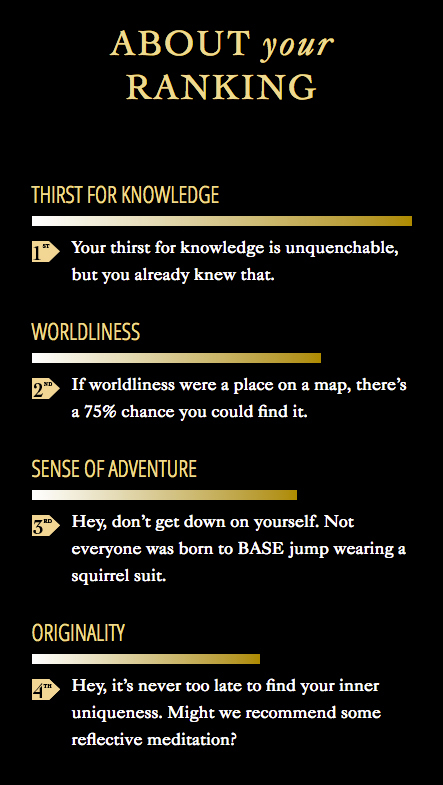 Attributes include your thirst for knowledge, worldliness, sense of adventure, and originality. The process is very quick, after which you are given your ranking and details about how your ranking was calculated. This writer earned the coveted spot of the 270,832nd most interesting person in the world, which can apparently be re-calculated again in one week, offering much-needed time to become more interesting. The ranking also comes with a humorous caption related to your “most interesting” ranking with prompts to share on Facebook and Twitter. 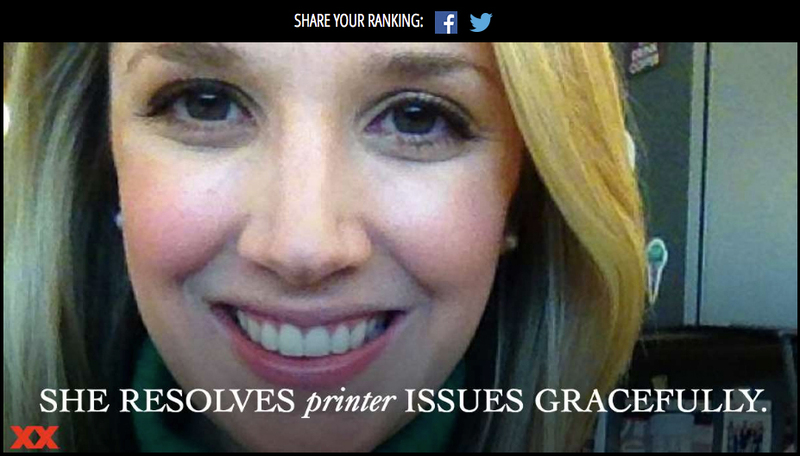 Mine said, “She resolves printer issues gracefully,” which (I’m not sure if I should admit) is impressively accurate. For those unhappy with their ranking, Dos Equis also offers tips on how to become more interesting. For this writer, suggestions included ordering something you cannot pronounce at dinner, climbing something, traveling more, acquiring something that can be considered an artifact, and exploring some ancient ruins. Mostly all achievable, right? 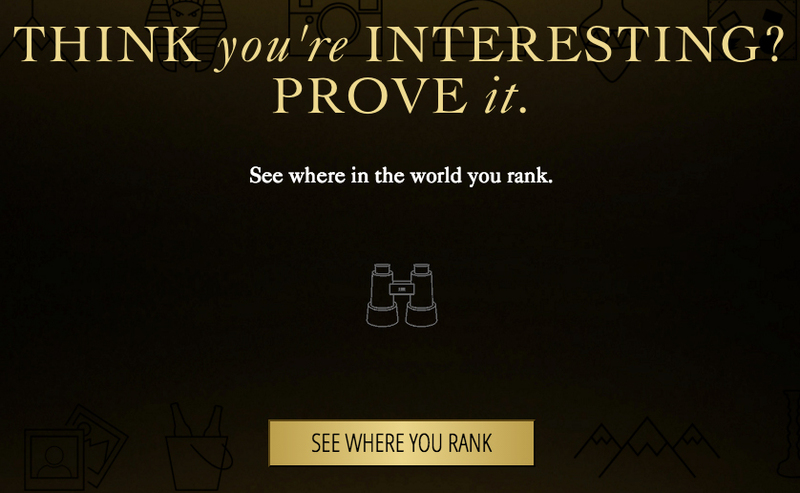 In addition to your ranking, Dos Equis is offering participants a chance to win a number of interesting, summer-themed prizes, including a trip to a Balloon Fiesta, a trip to Riot Fest in Chicago and Denver, plus Weber Grills. To promote the campaign, Dos Equis has tapped two interesting celebrities, Erin Andrews and Guzmán, who rank 5,008 and 5,007, respectively. These kinds of quizzes and competitions are personalized, interesting, and highly shareable. Remember when Buzzfeed quizzes came out? Or Microsoft’s “How old do I look?” This format continues to be adopted by companies, but what keeps it fresh for this campaign is how Dos Equis leveraged its “Most Interesting” theme as inspiration. While campaigns like this are fun and drive engagement, what happens when the campaign is over? There’s a huge potential here to take engaged participants and create “The Most Interesting Community In The World,” a.k.a. 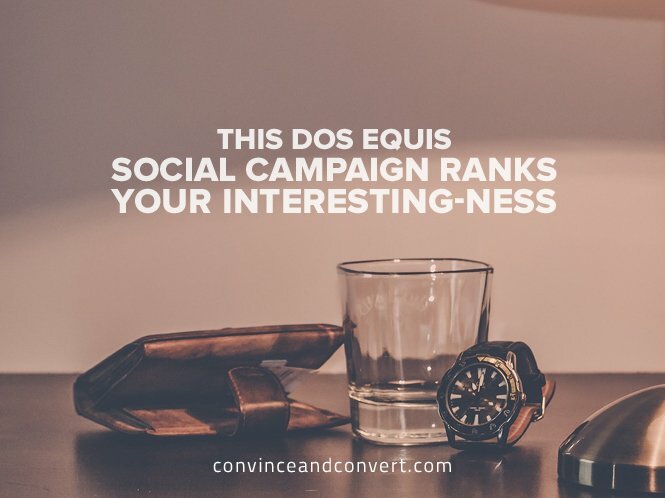 an advocacy community connecting and inspiring Dos Equis fans that choose to live incredibly interesting lives.